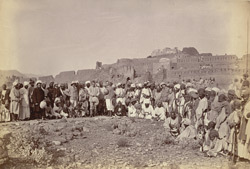 Photograph of Lord Mayo's party taken in Peshawar Bazaar and one of the series of views by Baker & Burke illustrating his visit to the city in 1870, whilst travelling through the North West Frontier Province. Lord Mayo was appointed Viceroy in 1869 and was assassinated in February 1872. During his Viceroyalty it was estimated that he had travelled 20,000 miles throughout India as he believed that he should see conditions in the country for himself and not stay cooped up in his office. Whilst at Peshawar he visited the Khybur Pass and rode to Kohat and back to hold a durbar with fontier chieftains. The next day he rode to Abbottabad and Hazara Valley. He completed this journey on 30th April having travelled nearly 3,000 miles in three weeks.